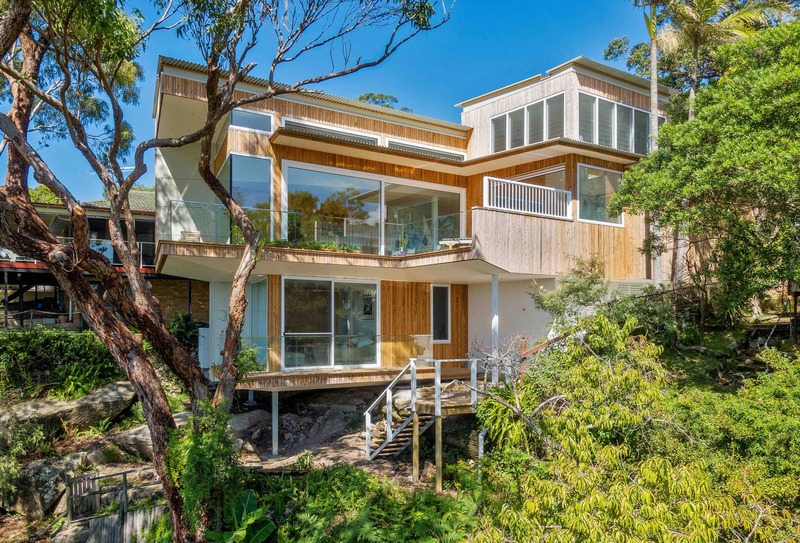 CLT proved to be the optimum solution to complex site conditions for constructing a beach house on a tight budget. The steep and narrow site with proximate adjacent houses had restricted access. This required a quick build with minimal disturbance to neighbours and the environmentally sensitive site. 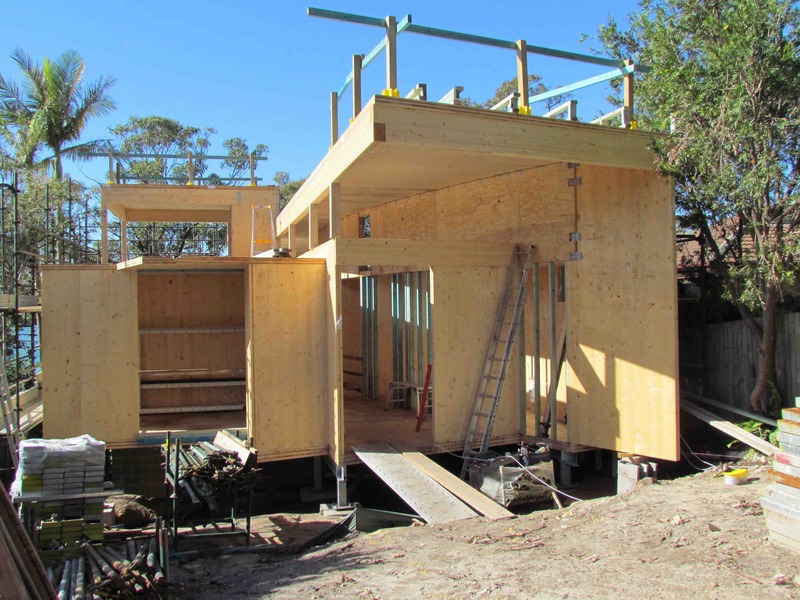 The lightweight, dual span and cantilever characteristics of CLT allowed elevated construction with reduced foundations, hence minimising excavation and site and flora disturbance. Prefabrication of the CLT structure allowed rapid construction with reduced traffic, waste, noise and dust pollution. 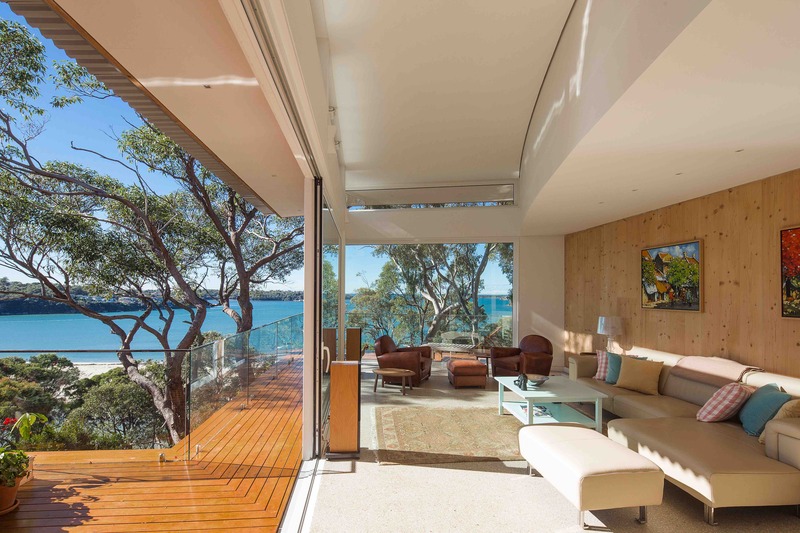 Raw cypress pine cladding minimised exterior maintenance in the marine environment. 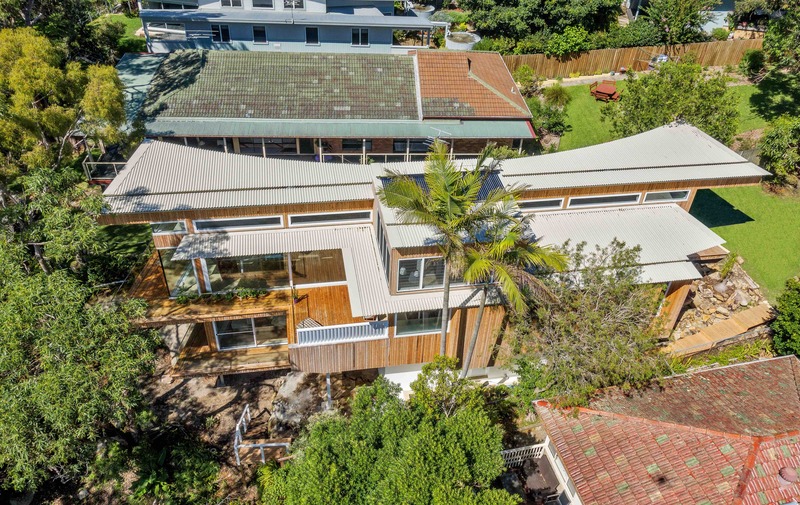 The solid timber structure and cladding reduced the carbon footprint and improved the thermal performance of the house. Mechanical fixings, physical termite barriers and avoiding glues and coatings, minimised VOC and pesticides. The CLT construction was cheaper than an equivalent concrete and masonry structure. 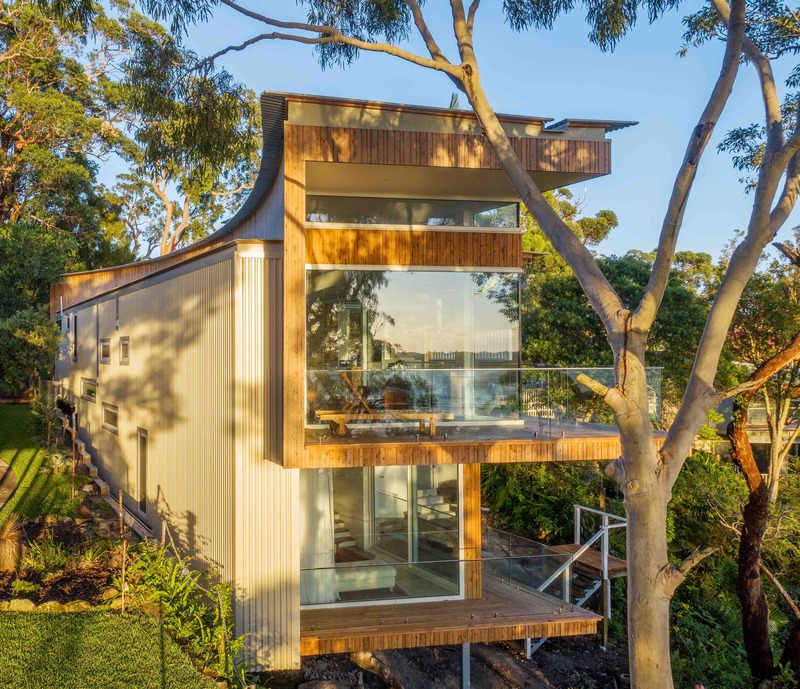 This is the first CLT house in Australia. The entire structure of the house is CLT and Glulam with the exception of the foundations. All suspended floors are CLT. 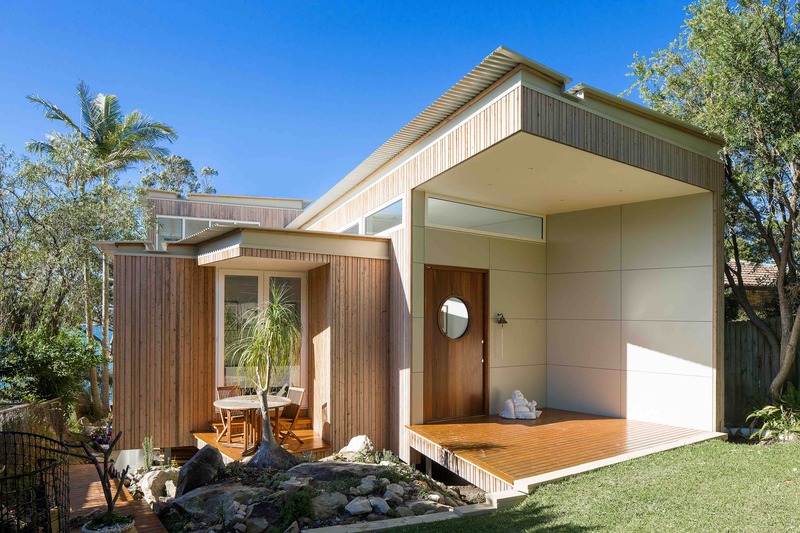 All external and internal walls are CLT, with the exception of the small portion of concrete block foundation wall and some internal timber frame walls housing services. The entire roof structure is CLT supported with Glulam beams. Glulam post and beam were employed to distribute the structural loads over clear spans and support the cantilevers. A large curved composite Glulam and Ply beam support the curved CLT roof edge along the length of the building. Non-visible quality finish was specified for the CLT due to budget constraints and possible site and water damage during container stuffing, shipping and transportation from Austria to site in Sydney. Nevertheless CLT was exposed as feature walls in the living room, master bedroom and outdoor room to great visual effect. All Glulam posts and beams were lined on the inside and clad on the outside. 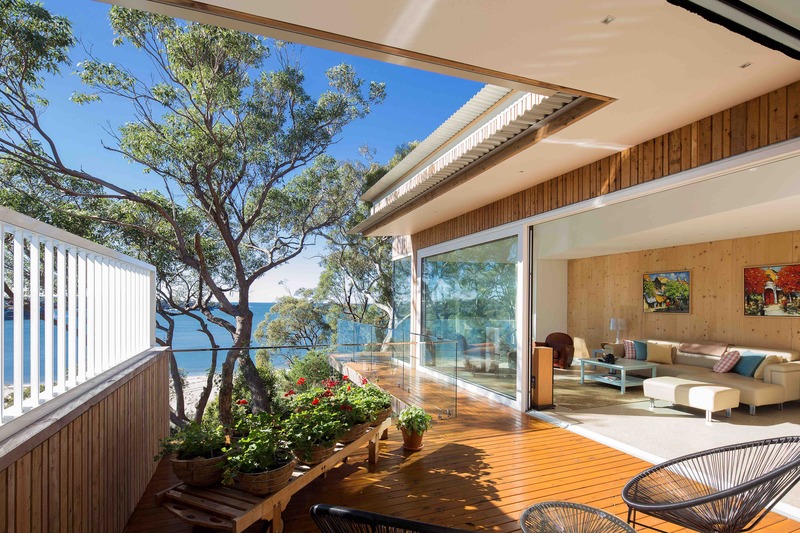 The solid CLT structure and timber cladding contribute significantly to the sustainability of the beach house. CLT and Glulam construction reduce the carbon footprint of the timber house. The solid timber is a carbon sink. Production of CLT is energy efficient with reduced fossil fuel input. The timber was sourced from KLH Austria using spruce with European PEFC certification as renewable resource (Certificate # HFA-COC-0097). 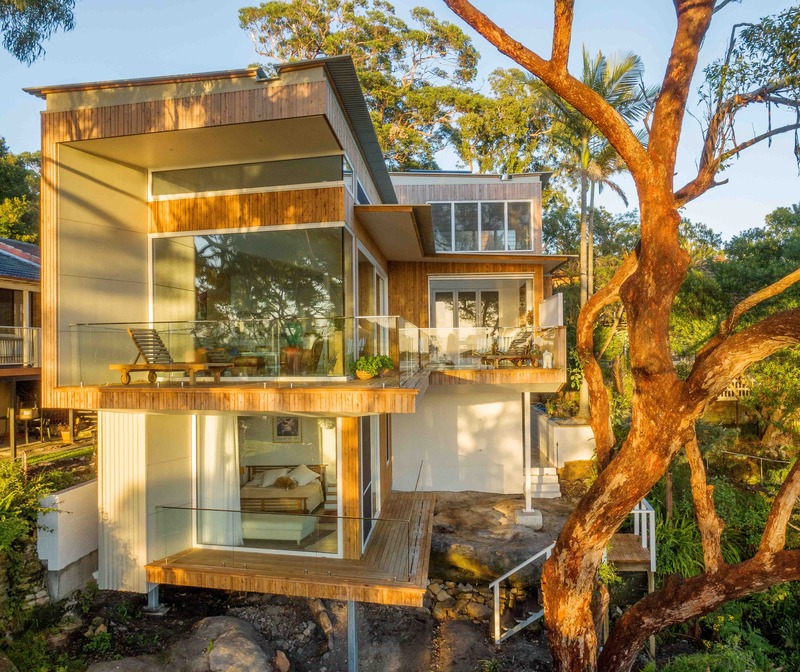 Solid cypress pine timber cladding allows further carbon sequestration and is sustainably sourced from Forests NSW to AS4708. The mechanically fixed CLT/Glulam structure and timber cladding can be de-constructed and reused. The relatively light weight solid timber structure allows large spans and cantilevers suitable for elevated construction on the sloping site. Minimal pier foundations are required reducing site excavation and disturbance. The prefabrication of the CLT and Glulam structure results in rapid construction with reduced transport and minimal construction waste. Occupational health and safety on site are much improved. 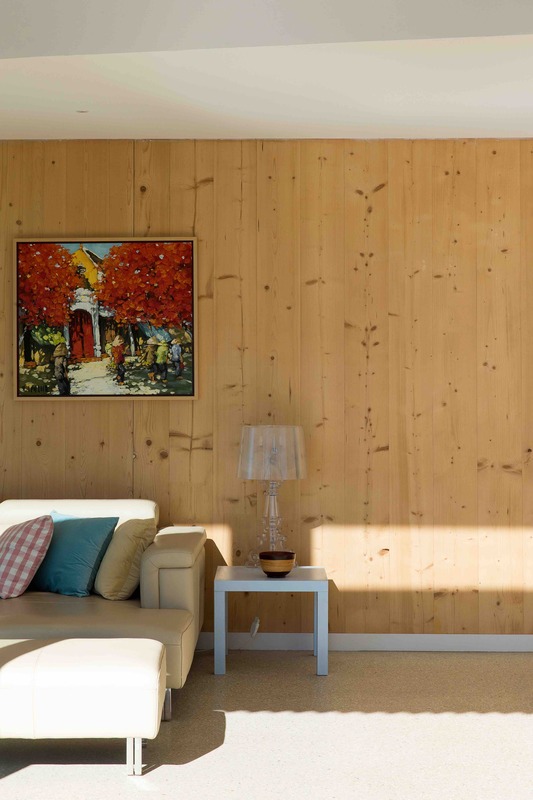 The installation of the CLT is low polluting with little dust and reduced construction noise. The CLT and Glulam are glued with solvent and formaldehyde free PUR adhesive. The structure and cladding are mechanically fixed without the use of construction adhesives. The timber cladding is uncoated. The result is a low VOC solid timber structure. The CLT is durable in the aggressive marine environment. The cypress cladding is left raw to age naturally requiring little ongoing maintenance despite the sea air. Rainwater is harvested from all of the roofs. All fittings are low water use. Solar evacuated tubes in conjunction with a heat pump provide hot water, including for the hydronic floor heating. A photo voltaic array with battery storage is to be installed. Exterior cladding is uncoated. Insect screens and physical termite barriers avoid pesticides. The elevated CLT construction minimise excavation and site disturbance, thereby protecting the native fauna and flora including the mature eucalypt tree canopy. Passive solar design floods the interior with sun in winter, while excluding the sun in summer. All round Insulation adds to the inherent insulation value of the solid CLT structure. Concrete screeds on the CLT floors enhance the heat bank ability of the solid CLT structure. The heat banks are passively heated in winter by the sun as well as solar hydronic floor heating. Cross ventilation and breezeways are employed. Summer stack ventilation is used whereby cool air is drawn in through floor vents from the undercroft and hot air exhausted through clerestory windows. 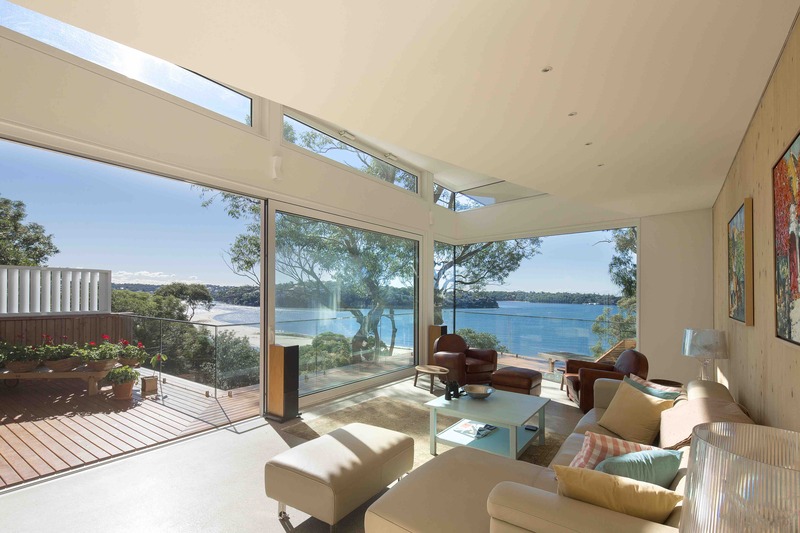 Daylighting is provided by all habitable rooms having windows on at least two sides. Internal finishes are low VOC. Construction adhesives have been reduced in favour of mechanical fixing.